Alice is normal; she’d never do anything rash. But when she sees her husband one day with a younger girl, she knows at once that he’s having an affair. And it must be stopped. Vic loves her friend Michael, more than he knows. He wants happiness, and thinks he’s found it with the magnetic Estella. But Vic feels sure she can’t be trusted – and she needs to make Michael see that too. They don’t know Kaya; her life is tougher than they can imagine. But Kaya’s a survivor, and she’s determined to find a way out of her miserable world. I Received this book through Book Bridgr and Tinder Press for an honest review. 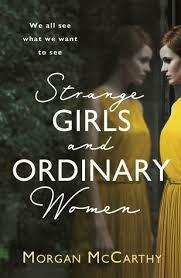 Strange Girls and Ordinary Women tells the stories of three women whose lives end up colliding. Each Chapter switches between the 3 women. I felt personally that this was done quite abruptly for me it just didn’t seem to flow. Victoria (Vic) I just did not seem to grasp the character and found her very confusing and a bit whiny.